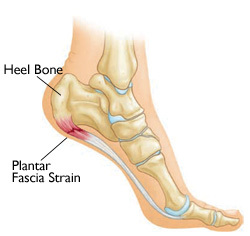 Plantar fasciitis is the most common injury occurring at the hind foot, and is an irritation and swelling of the fascia on the plantar aspect of the foot. Pain generally is located at the posterior and medial aspect of heel. Plantar fasciitis can be found in both rigid and hyper mobile feet. With excessive pronation, the plantar fascia is overstretched as the medial longitudinal arch collapses. In a rigid foot, the calf muscles may be tight, limiting the dorsiflexion and putting more strain on the fascia as the foot moves into toe off. Other contributors are obesity, sudden weight gain, shoes with poor cushioning or support, occupations with prolonged standing/walking and a sudden increase in activity intensity, time or type. Burning pain at the attachment of the plantar fascia on the heel. Pain is usually worse in the morning and with push off. May develop into a heel spur if chronic. If caused by excessive pronation, we suggest a stability or motion control shoe along with an orthotic insert. Heel cups may relieve pain symptoms. Read more about The Strassburg Sock here!